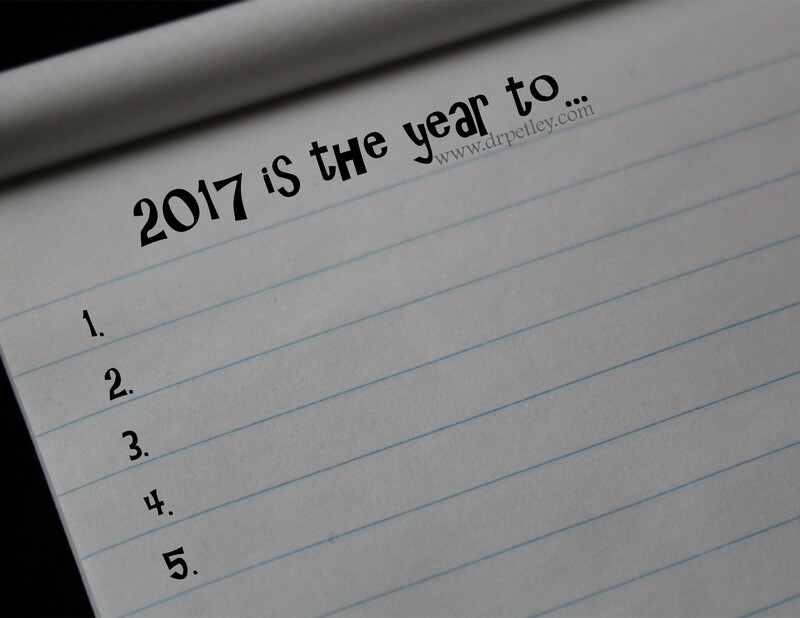 As many of us do this time of year, I am creating my resolutions for the new year of 2017. In review of the lists I’ve made in previous years, I noticed they generally focus on health: lose a few extra pounds, clean up the diet, exercise three to five times a week, increase water intake, and so on. All good things, yet I am merely repeating the same goals year after year. However, this year, they’re not going on the list. It’s not that I don’t appreciate the focus on health (I’m a naturopathic doctor, so of course I think health improvement is important), but this year I’m moving health improvement goals to my daily list (daily goals that I need to do every day to maintain overall health – like drinking adequate water). They are constants in my life and I don’t want to wait until 2018 to realize that I stopped exercising regularly sometime in the spring. Let every change of the calendar be an opportunity to reevaluate the daily goals for improved health. These check points could be every new month, new day, or perhaps every new moon. This ensures we stay on top our game all year long. It also changes how we view our yearly resolutions list. This year, my New Year resolutions theme is go big or go home. I’m asking myself what I’ve always put off doing yet always wanted to accomplish. Some might call this their bucket list. But a bucket list is something you get to someday. This year, I’m moving my bucket list to my New Year resolutions list. I’m taking note of the various steps I may need to take to help meet these goals. I’m asking myself why I haven’t met these goals before. What is really standing in my way? How can I remove the obstacles? These are the items I’m writing on my resolution list for 2017. For those who like numerology, 2016 held the energy of the number 9 – transformation and the end of a cycle. Hindsight is always 20:20 so it’s easy to see what we changed on both personal and global levels in the past year. Removing what isn’t needed isn’t always easy. Shedding makes room for the new so it is best that we do not dwell on the loss. It’s like a diet that focuses on what we can’t eat. It always feels like something is missing. The year 2017 holds the energy of the number 1 – the start of a cycle. This is the year to start new projects, new beginnings, and make decisions that support the larger goals. 2017 isn’t about what we had to give up in 2016; it’s about the transformation we went through to better understand the possibilities that lie ahead. It’s like a diet that focuses more on how to fill the void of what we are eliminating with all the greatness of what we can eat instead. Let 2017 be your big year of success. Accomplish the goals you never dared to add to your resolution list.